Is Yasiel Puig baseball's worst baserunner? (Hal) McRae was the most aggressive baserunner of the 1970s, a man who left home plate thinking "double" every time he hit the ball. The rule allowing the second base umpire to call a double play if the runner from first leaves the baseline to take out the pivot man is known informally as the McRae Rule. ANAHEIM  The Dodgers designated veteran utility man Chone Figgins for assignment Wednesday after his allotted days for a rehab assignment ran out. The Los Angeles Dodgers just placed Chone Figgins on the disabled list due to a left quad strain over the weekend and Juan Uribe, while getting closer to returning to action, is still not all the way back from his hamstring injury. LOS ANGELES -- Not only did the Colorado Rockies pull themselves out of a nosedive this weekend, they may have kept the Dodgers hopes of an NL West pennant race alive with their first three-game sweep at San Francisco in six years. CINCINNATI -- If you were paying only fleeting attention to the Los Angeles Dodgers' 5-0 loss to the Cincinnati Reds on Wednesday night -- say clicking back and forth between it and a hockey game -- you'd probably think it had a lot in common with all those listless games this team rolled out on its most recent homestand. NEW YORK -- That's not the way to get red hot. You don't do it by giving away two runs because of errors. You don't do it by giving up a tiebreaking run because your pitcher throws a wild pitch to a batter trying to bunt. How do Dodgers handle infield injuries? 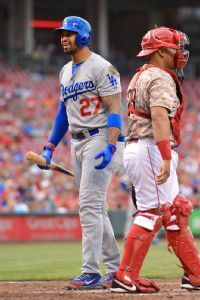 The Los Angeles Dodgers could be without their starting third baseman for the next few weeks after Juan Uribe reinjured his right hamstring on Tuesday night against the New York Mets and had to leave the game as a result. LOS ANGELES -- The Dodgers are cautiously optimistic Juan Uribe can avoid the 15-day disabled list, with manager Don Mattingly saying Uribe would even be available as a pinch hitter or as part of a double switch during Monday nights game with the Miami Marlins. LOS ANGELES -- After Friday nights shouting match between Los Angeles Dodgers outfielder Yasiel Puig and San Francisco Giants pitcher Madison Bumgarner over Flipped-Bat-Gate -- and then the ejection of L.